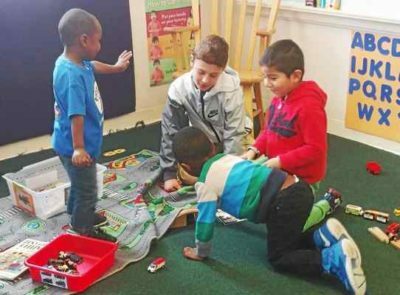 Dutchess Day at Head Start | Astor Services For Children & Families | …Because every child deserves a childhood. | …Because every child deserves a childhood. The entire seventh-grade class at Dutchess Day School in Millbrook traveled to Poughkeepsie on Dec. 8 to visit the largest of the Astor Head Start schools to deliver a school bus filled with holiday gifts and to spend the afternoon reading to, and playing, with the school’s children.